Choose from a morning or afternoon buggy tour then, following a pickup from your Marrakech hotel, travel out of the city to the snow-capped peaks of the surrounding desert. 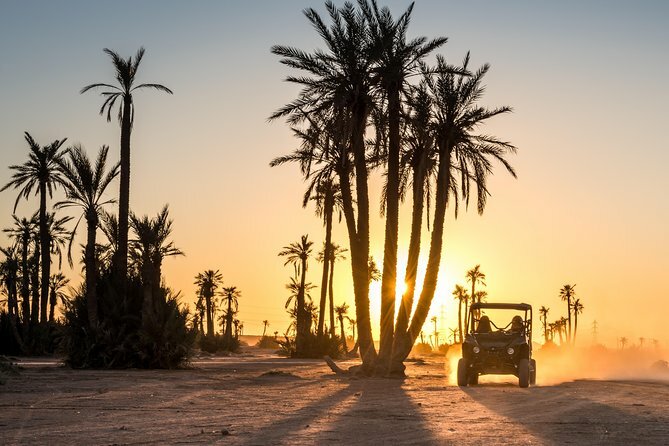 Life ticks by at an altogether slower pace in the rugged desert outside bustling Marrakech, with ancient palm groves and welcoming Berber villages to explore. Arrive at base camp and take the time to master the controls of your quad bike during a safety briefing. Then, after receiving all the protective gear you need, follow your guide along the dusty dirt tracks crisscrossing the desert and head off into the wilderness. Travel over rocky terrain and dry riverbeds to wild palm groves, and admire ancient volcanic formations in the landscape around you. Your guide will keep a close eye on your group’s speed to ensure the tour remains safe and enjoyable for everybody. As the sun moves across the sky changing the desert hues through ocher and soft crimson, pull over with your guide in a traditional Berber village and enjoy a warm welcome in a local household. Replenish lost energy with a snack of hot pancakes and a pot of fresh Moroccan tea, and enjoy a little conversation with your hosts. When it’s time to wave a fond farewell to the Berber villagers, hop back aboard your buggy and travel back to base for the onward journey to your Marrakech hotel, where your tour will come to an end. Please note: Children aged 6 to 15 can participate as passengers. Drivers must be aged 16 and older. Each buggy is suitable for two people. If you require 2 vehicles for 2 people it's advisable to make 2 separate bookings. Your central Marrakech hotel or the closest point accessible to vehicles. Closed-toed shoes and long pants are recommended. No shorts or skirts. Jackets are recommended in winter.